At the end of August in Cortina d’Ampezzo cars and watches exceptional met under the banner of Joie de Vivre. After the Festival International de Jazz de Montreux, the gatherings of balloons and the partnership with Bugatti , Parmigiani Fleurier la Maison at the end of August 2012 has linked its name in Italy at a major sporting event: the 65th edition of the Cup Dolomites Gold held in Cortina d’Ampezzo from August 30 to September 2. This year the famous classic regularity event has retraced in the second stage tour that he used to deal with Hemingway, in which the protagonists are the steps that surround the valley Ampezzo. The trail is articulated at high altitudes, between Passo Tre Croci, Misurina, Dobbiaco, Corvara, Canazei to Falzarego, before returning to the valley in the center for the presentation of historic cars with registration prior to 1961. Driven by the passion for adventure and the desire to always put to the test in the quest for absolute precision, the Manufacture Parmigiani Fleurier shares much of the spirit of this competition, created in 1947 as a great appeal to enhance the balance of the car and challenge the talent and daring team of pilots. Parmigiani Fleurier – Brand contemporary – draws with passion from every culture and civilization, driven by boundless energy and vitality. That’s why the brand has chosen the Golden Cup to showcase its new collections and mechanical wonders. 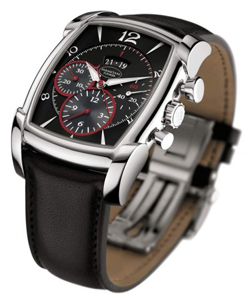 La Maison awarded the winning team, with a chronograph Kalpagraphe expression of power and precision. Made of stainless nell’iconica tonneau-shaped, this watch is characterized by the design of the box with impressive chronograph buttons integrated. Born for adventure, Kalpagraphe has perfect ergonomics ensuring excellent comfort even during the most extreme challenges. The game ideal proportions of the total membership of the curves allows the watch to the wrist. 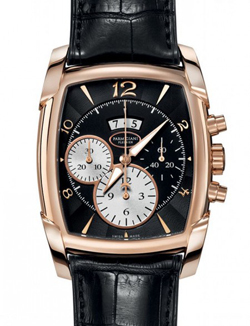 The chronograph is water-resistant with a resistance to external agents thoroughly tested. As a final detail, the Hermes leather strap in black leather gives the model the flexibility to the best fit. The mechanism with automatic winding with autonomy of 55 hours ensures a comfortable everyday use. The three days of Cortina was the setting also another time that Parmigiani Fleurier has decided to celebrate in his own way the “old fanatic of the Veneto,” as Ernest Hemingway liked to call himself. As absolute showcase for, and celebration of the theme of time and travel, the brand has organized the rest of the Cortina Collection Atelier, a rotating collection of unique pieces of Haute Horlogerie in the style of Parmigiani Mesure et Demesure. The watches Parmigiani Fleurier has always communicate virtuosity and joy, and extravagance accuracy, precision and innovation beyond measure. It also provides a totally new concept in the field of Haute Horlogerie, such as the collection “nomadic” Atelier : exclusive and produced in limited, the Atelier Collection is the interpreter of unique jewelery creations, admired for the beauty of the setting of gemstones or for the extraordinary mechanical complexity. The universe of the Manufacture Parmigiani Fleurier revolves around the journey into the heart of excellence and joy of living.